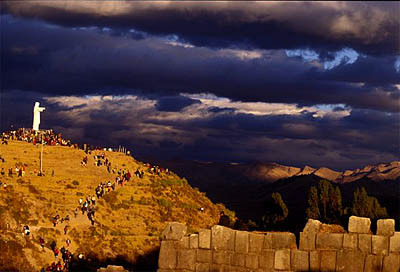 Procession at Saqsaywaman, Cuzco, Peru. One of Peru's most talented young photographers, her prize-winning photos have been shown in more than a dozen expositions over the past decade and published in the principal national and international magazines. Most recently, she has been commissioned by a leading Peruvian newspaper to document the country's major ecological destinations and to create photo reports on Africa and Europe.